Bang & Olufsen Beovision Harmony hands on review | What Hi-Fi? Another triumph of design from B&O? 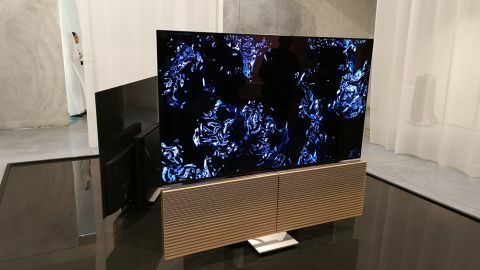 Bang & Olufsen has used Milan Design Week to debut its Beovision Harmony all-in-one TV and speaker system, and we have been in northern Italy to get a first look. More than a mere design trinket or showpiece contraption, B&O has created something truly original but with the onus still on providing premium sound and vision to match the product’s high-end aesthetic and price tag. A three-channel speaker system, housed in oak and aluminium, conceals the Harmony’s 77-inch LG OLED C9 television screen while the system is turned off or playing music, and fans out in a butterfly-like effect as the screen raises to ideal viewing height when it's switched on. B&O has been keen to offer a powerful sonic performance, and as such has bestowed upon the Beovision Harmony a speaker array featuring a one-inch tweeter, two 2.5-inch full-range drivers, a four-inch midrange/woofer and another pair of four-inch bass drivers. Each powered by a dedicated amplifier, the drivers are fed with 50W each for the tweeter and full-range drivers, and 100W of power for the trio of woofers. Despite its lavish design, the Harmony promises to work much as any modern home cinema sound system, with services such as Tune-In radio and Deezer integrated and streaming possible via Apple Airplay 2, Chromecast built-in or Bluetooth. A built-in 7.1 surround sound decoder and B&O multi-room capabilities also allows owners to connect up to eight of the company’s Beolab speakers for a truly immersive TV performance, while a further eight can also be added with wired connection. Retailing from 18,500 EUR, and available in Bang & Olufsen stores from October, Beovision Harmony is certainly not something you’ll want to be replacing after only a few years. But, while it isn’t yet part of the company’s marketing of the product, when we spoke to Vice President of Product Management Christoffer Poulsen, he told us the ability to upgrade the screen in the future is something for which B&O has planned. You’ll likely be unsurprised to read that the Beovision Harmony’s spread-armed dance is quite the thing of wonder. While on the surface it may sound quite gimmicky – we’d be lying if we said that wasn’t our first thought upon reading about it as well – the smooth, silent motion with which it opens up and unveils the screen is little short of theatrical. And that screen is one we like, too. We saw a 65-inch version of LG’s C9 OLED TV earlier this year at CES, and were enamoured with the inky blacks and fine detail on offer at first viewing. The 77-inch version present here showed little in our short demo to suggest it’ll be any less of a fantastic set. But the Beovision Harmony will live or die by its sound. A few caveats here to our test: Bang & Olufsen is still fine-tuning the speakers, hence a finished product won’t be available until the autumn, and the gallery space we heard it in was rather noisy and with hard walls and large windows not particularly conducive to great sound. That said, we can certainly confirm B&O has been able to come through on its promises of power. Though exceptionally taut bass was never really going to be on the agenda in a setting such as the one we were in, the Harmony digs deep and deals its blows with venom; you could be fooled into thinking there was a dedicated subwoofer at play. Musically, things seemed to hang well together as well. We were treated to excerpts from The Greatest Showman and Bohemian Rhapsody, both of which sounded pretty well judged in terms of timing and dynamics – which as we well know is no easy feat. Of course, the question of who will buy it always looms large over a product such as this. Many customers will be those concerned only with its design, as is their right, and the Harmony is a marvellous feat of engineering, but our initial feeling is that they’ll also be getting a fine TV system along with it. It won’t sate the appetite of home cinema traditionalists, but nor is that its intention. If you have a good few grand burning a hole in your pocket come October, and you value form above function, it’d certainly do no harm taking the Beovision Harmony for a spin.